What is this Mount Bromo, anyway? Mount Bromo (Gunung Bromo) is an active volcano in East Java, Indonesia. It is also one of the most popular tourist sights in Java. The volcano is even featured in the cover of the Lonely Planet Indonesia travel guide! Is it possible to visit Mount Bromo without a tour? Yes, it is! Although most people visit Mount Bromo on a tour from Malang or Probolinggo, you can visit the Bromo-Tengger-Semeru National Park on your own. The best spots for tripods are taken early. Why should I experience Mount Bromo without a tour? 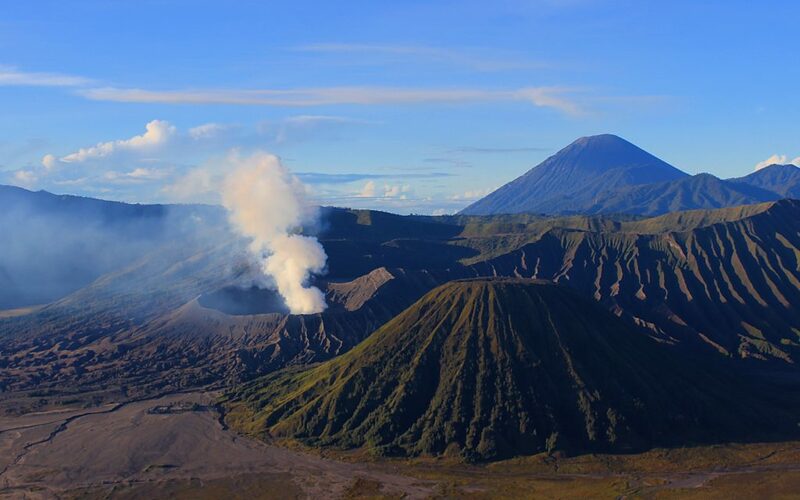 There are two main reasons to visit Mount Bromo without a tour: time and money. If you visit Mount Bromo on a tour from the nearby cities, you have to wake up very early to see the sunrise. The Bromo tours from Malang to Mount Bromo leave at around 1.30 am, and the bumpy road doesn’t make sleeping in the car easy! The tours cost more around 600.000 Indonesian Rupiah (40 euros) per person. If you visit Mount Bromo without a tour, you get to see the same sights, but you also have more time to explore the area. 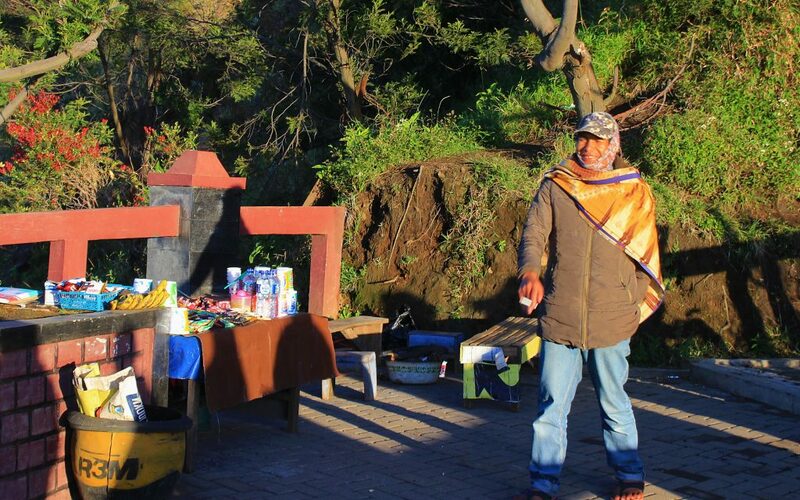 Local vendors sell drinks and snacks at the viewpoints. How do I get to Mount Bromo without a tour? 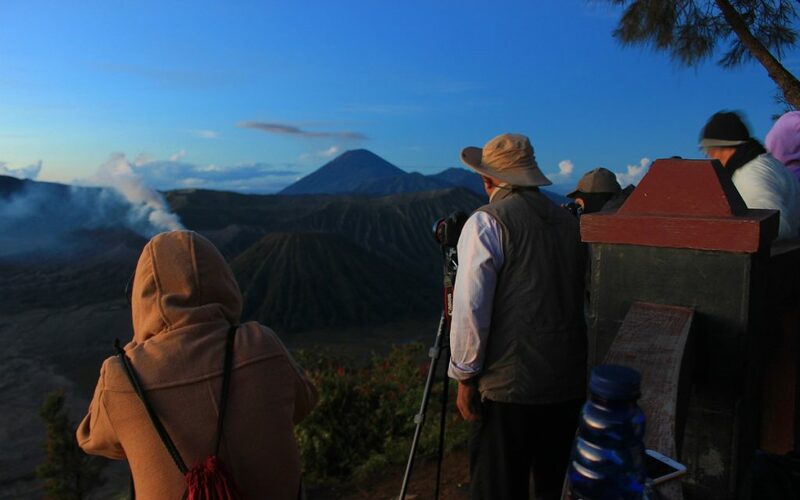 If you want to see Mount Bromo at sunrise, you first need to get to the village of Cemuru Lawang. Taxis can be quite expensive and Uber drivers don’t usually drive to Cemuru Lawang (unless you pay an extra high price). Therefore the cheapest way to get to Cemuru Lawang is by public transport. The minibuses to Cemuru Lawang leave from Probolinggo. If you’re in Malang, take an angkot (local minibus) or other transport to Arjosari bus station 5 km north of town. The angkot costs 5000 IDR (0.35 €) per person. Ask for a bus to Probolinggo – and remember to negotiate the price down! We paid 30.000 IDR (2€) for the 2½ hour bus ride after some bargaining. The minibuses from Probolinggo to Cemuru Lawang leave outside Bayuangga bus terminal a few kilometers out of the city. Tell the driver that you’re heading to Cemuru Lawang, and he’ll hopefully drop you off at the right place. Once in Probolinggo, you’ll get into a minibus that costs 35.000 IDR (2.4 euros) per person if the minibus is full. The ride uphill takes approximately 90 minutes. Okay, I got it. But you didn’t mention anything about the timetables. That’s because there aren’t any! However, be aware that there are only few minibuses heading to Cemuru Lawang. The minibuses leave when they’re full, so you can never know for sure when you can catch one. The sooner you get to Probolinggo, the more confident you can be about catching a ride. When we visited Mount Bromo in late March (off-season), there was only one minibus going from Probolinggo to Cemuru Lawang after midday. We arrived in Probolinggo at 5 PM, and the bus left straight away as we filled the last empty seats. Passengers who had arrived in Probolinggo much earlier ended up waking up to four hours and taking the same minibus. Mount Bromo (2392m) is the smoking crater on the left. The mountain in the front is Batok (2440m), while Java’s highest point Mount Semeru (3676m) looms in the background. Where can I stay in Cemuru Lawang? Cemuru Lawang is full of places to stay. In fact, many of the buildings in the village are virtually empty – they are just there to accommodate travellers. If you haven’t made a booking in advance, you will soon find locals who’ll offer you places to stay. Once again, remember to bargain. After lengthy negotiating, we got an empty building with two bedrooms and a warm shower for 150.000 IDR (10.3€) a night. It’s easy to cross the Sea of Sand. What should I do in Bromo-Tengger-Semeru National Park? Most people come to the National Park to see the sunrise over Mount Bromo. There are two main areas where you can do this. 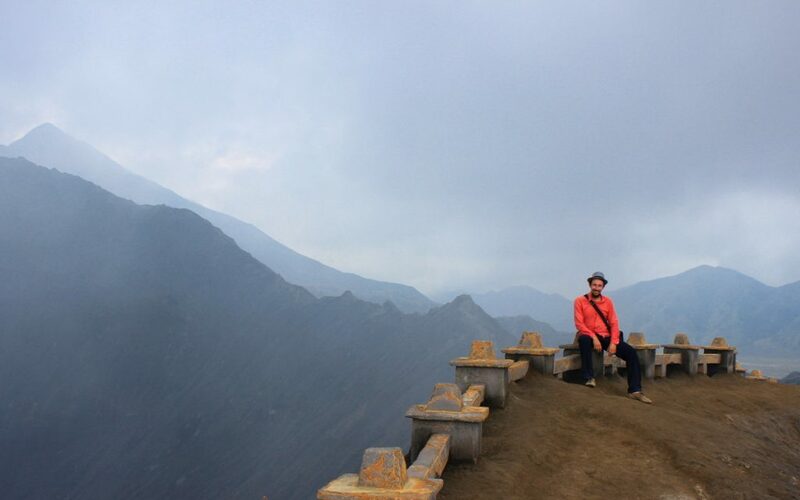 Either you can climb to one of the viewpoints at Mount Penanjakan, or you can head directly to Mount Bromo itself, where you can walk on the edge of the active crater. 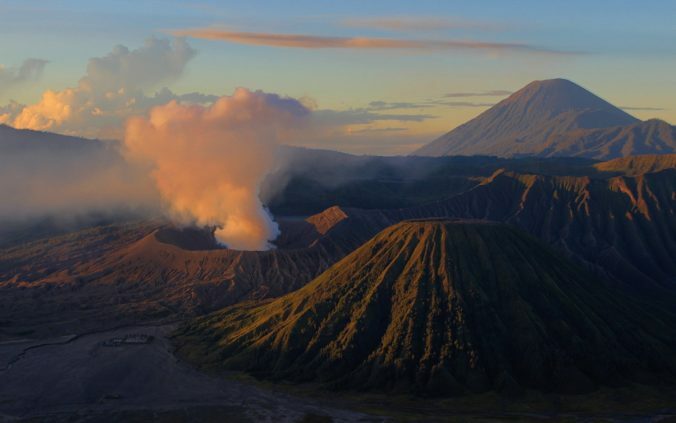 The iconic shots of Mount Bromo are taken from Mount Penanjakan, and this is the more popular choice. The trek to Mount Penanjakan involves lots of climbing on smaller paths. 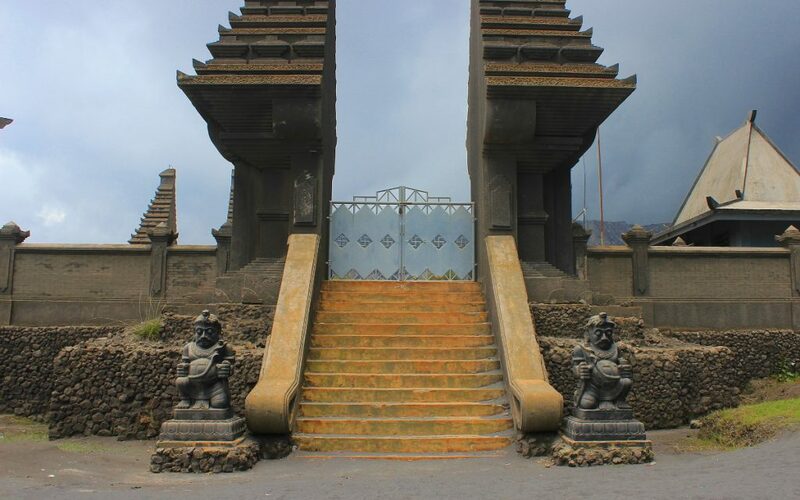 The climb to Mount Penanjakan takes almost two hours. Start walking around 3 AM to catch the sunrise King Kong Hill or some of the other viewpoints. The hike to Mount Bromo is easier, as you mostly walk on the flat Sea of Sand. 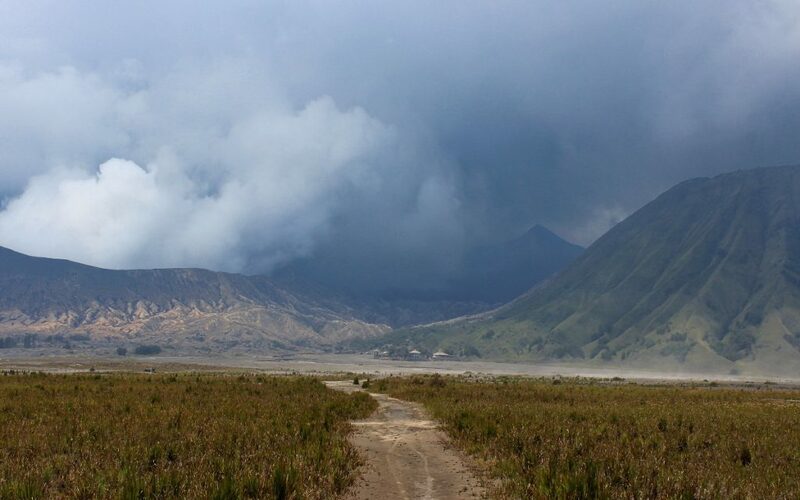 The 3-kilometer walk to Mount Bromo can be done in less than an hour. There’s even a Hindu temple at the Sea of Sand, although it’s usually closed. 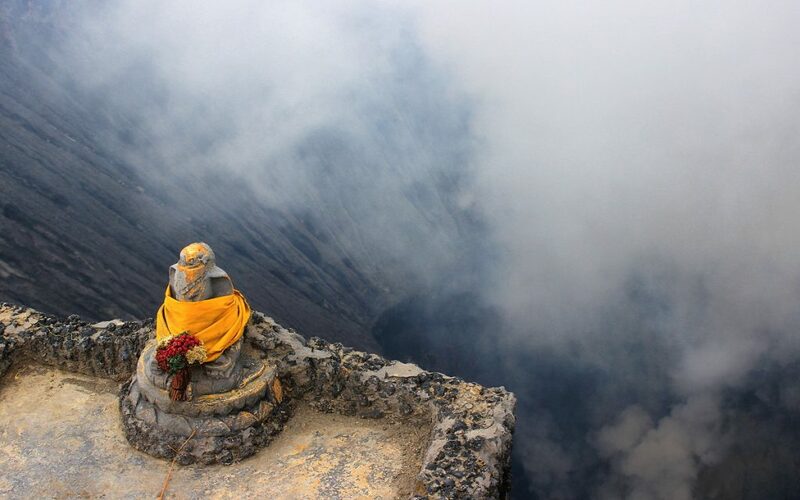 Mount Bromo has been worshipped as a god, and people still give offerings to the crater. Can I trek both Mount Penanjakan and Mount Bromo during the same day? Yes, although it can be quite exhausting. If you go to the viewpoints for the sunrise, you might want to return to the village in between to drop off your warmer clothes. The night is chilly, but midday is not. Grab a lunch and take a rest before heading to the volcano. If you get tired of walking, you can always pay for a motorcycle ride to Mount Bromo. You can get an accommodation in Cemoro Lawang for two nights to see the sunrise in both locations. How do I get out of Cemoro Lawang? Most tourists return from Cemoro Lawang to Probolinggo before noon. The price of the tourist minibus ride is split with other passengers, so the fuller the bus, the less you pay. We paid 50.000 IDR per person when we left Cemoro Lawang after 3 PM, but such late departures are quite uncommon. Our minibus had 8-10 passengers. If you plan to continue your journey from Probolinggo, note that the buses are overpriced and probably a lot worse than promised. As a tourist, it’s very difficult to get a fair price for your bus ride out of Probolinggo. 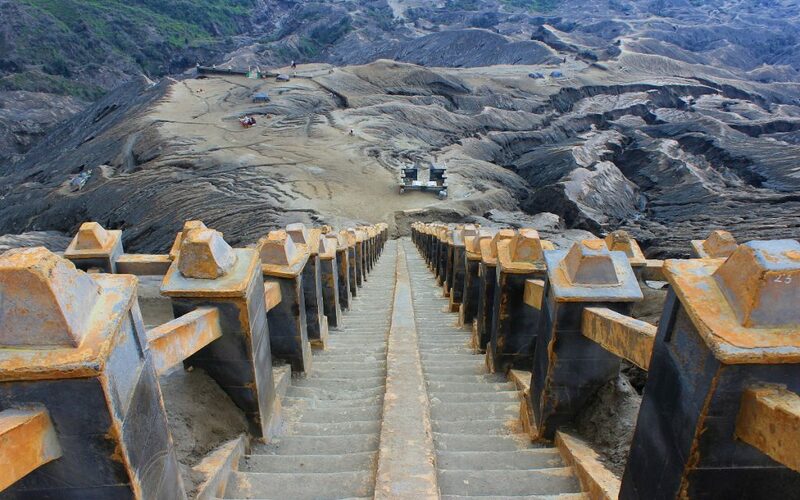 The climb up to Mount Bromo is surprisingly easy, and there’s a stairway on the side of the volcano. Do I have to pay an entrance fee to see Mount Bromo without a tour? Um, well… technically, yes. If you visit Mount Bromo on a tour, you definitely have to pay the entrance fee that costs 218.000 IDR (15 €) on weekdays and 320.000 IDR (22 €) on weekends (as of 2017). This is a foreigner ticket for Mount Bromo itself, not the viewpoints, so don’t pay it if you won’t visit the crater. Many locals will try to scam you with the ticket prices, so be careful. There’s another 10.000 IDR (0.7 €) entrance ticket that you need for the viewpoints. This ticket is sold before you enter the village of Cemoro Lawang, although we just took our backpacks and left the scene without paying the fee. If the entrance fee for Mount Bromo sounds too expensive, it’s also possible to avoid that one. A small path from Cemoro Lawang to the Sea of Sand starts from behind Cemara Indah, and there’s no ticket booth on the route. If you have the MAPS.ME app, the path is marked as “Villagers trail to Bromo”, which is followed by “Free Way to Bromo” across the Sea of Sand. How much does it cost to visit Mount Bromo without a tour? Getting from Malang to Cemoro Lawang cost us 70.000 IDR per person. In Cemoro Lawang, we ate in local family restaurants (warung) where the meals cost around 10.000-20.000 IDR. I paid 50.000 IDR for my stay in Cemoro Lawang when we shared a house with three people in total. We didn’t pay any entrance tickets. The most expensive part of my trip was the departure journey from Cemoro Lawang to Banyuwangi through Probolinggo. This cost me 175.000 IDR (12 €). The local price for the bus from Probolinggo to Banyuwanggi is closer to 50.000 IDR, but I was too tired to bargain at this point. In total, visiting Mount Bromo without a tour cost me approximately 350 000 IDR (24 euros). A shrine at the edge of the crater. Is Mount Bromo worth it? Yes, it is! If you’ve never been to a volcano before, you’ll be amazed by the extraterrestrial landscape. Hiking through the Sea of Sand felt like visiting another planet, and the sunrise was stunningly beautiful. I’m also glad I visited Mount Bromo without a tour. The extra freedom gave us more time to explore and enjoy the atmosphere. We hiked to Mount Penanjakan in the middle of the night, and that hike was one of the most magical experiences of my trip around the world. At some point, we just stopped to lay down and look at the clear night sky above us. As there were no city lights nearby, we could easily see the stars and Milky Way above us. That was a moment I won’t soon forget. Thank you very much for these answers. You are awesome! You’re welcome! I know I am. Sitting on the top of Mount Bromo. Thanks for sharing! And for the Map app, I hope its accurate to follow the trail up to Penanjakan. I’ll be travelling there next month, anyway what are the chances I can share a jeep with others in Cemoro Lawang? 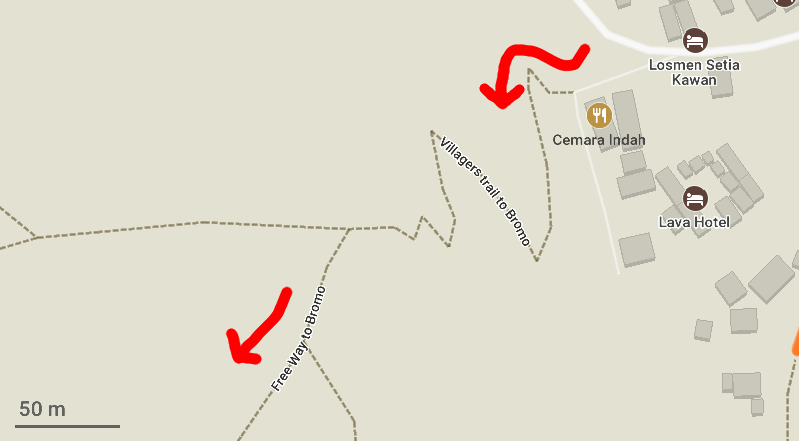 Yes, MAPS.ME also has the Penanjakan trails and viewpoints marked! Google Maps is missing them, so MAPS.ME is better around Bromo. Great loads of info and yes, you’re awesome! Would you mind sharing the name of the accommodation? 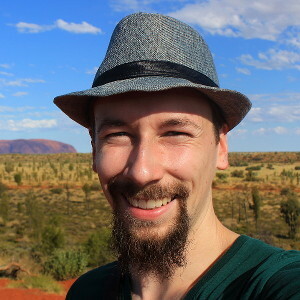 Alll in all, lots of good tips to be reminded of from this post and I enjoy reading your way of writing. Ah, accommodation Cemoro Lawang… ha ha ha. Well, I don’t know if our accommodation had any name! 😀 When we showed up, there was nobody around at the place we originally booked online (they never answered the phone or our emails, either). However, a local guy with keys to several of the empty houses came to us and offered us different places to stay. There are some more organized accommodations in Cemoro Lawang, too, athough they are more expensive and often fully booked. It’s a good sharing. Keep it up. First, thank you for your super useful and clear information, but I still have some questions want to ask you ><. We have four people, so we prefer to stay in Malang on day form Jagja by train and we may hire a driver to take us to Cemoro Lawang , Probolinggo. The reason why we want to hire a driver instead take the public transportation is that we have four people can share the driver fee. Moreover, we can save much time to swap buses. What do you think about my idea? Could you please give me some feedback? So, would you stay overnight in Cemoro Lawang or just do a day trip? If you just go for the day and want to see the sunrise, you have to leave Malang very, very early. If you stay overnight, hiring a driver might work and save time from the bus swap! I’m not sure about the price, though. We used public transport, so all I know that getting an Uber/Grab from Malang to Cemoro Lawang is quite impossible. We tried to do that first, but the drivers always cancelled when they heard of our destination. Is the entrance to Mount Penanjakan and Mount Bromo the same? Can you clarify what you mean by entrance? Mount Bromo and Mount Penanjakan are on somewhat different directions from the village of Cemoro Lawang. It’s possible to walk from one to the other directly, although the road is quite long (you can also hire motorcycle driver to take you). We returned to Cemoro Lawang in between to have a break and eat. Most buses leave earlier than 7 pm, so you’d need to be lucky to catch one after that! Uber drivers don’t usually drive to Cemoro Lawang unless you pay a lot of extra money. Oh can you tell me why you can take the photo that is empty there? Because I always see the crowded scene when conquering Bromo Mount. I guess it was because it wasn’t a very high season, and we hiked to Bromo in the afternoon when many people had already left the area. Hi arimo, isn’t it too hot for kids if i were to hike bromo in the afternoon? And is it possible to bring 2,4,6 year old (2yo on my back) to hike Penajakan? Can we camp up there? it is easy to find motor/jeep hire there? It depends on the season, but if it is sunny, it can be very hot to hike to Mount Bromo in the afternoon. We (two young men in relatively good shape) were exhausted by the end of the day after hiking both to Penajakan and Bromo in the same day. The hike to Penajakan is also quite long and challenging, so it might be too difficult for little children if you want to go see the sunrise. I don’t believe it’s possible to camp there, but I’m not sure. Most of the jeeps I saw came from the cities during the night. There are motorcycle drivers around and it might be possible to hire a jeep in the village as well, but I’m not certain about it. Thanks Arimo! With your feedback, now it is easier for us to make decision and early planning.